/ Modified jan 17, 2019 1:18 p.m. The Arizona representative's first bill would allow DACA recipients to work on Capitol Hill. 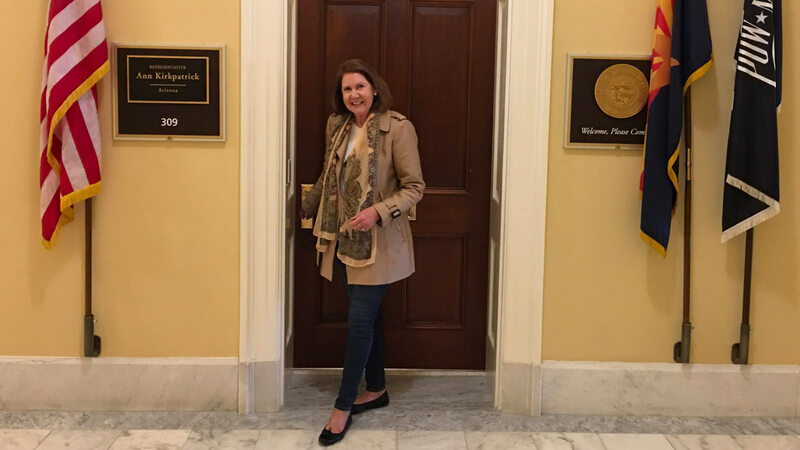 Rep. Ann Kirkpatrick, D-Tucson, stands outside her congressional office in Washington, D.C., in this photo posted on her official Twitter account. U.S. Rep. Ann Kirkpatrick filed a bill Thursday to allow people covered by the Obama-era Deferred Action for Childhood Arrivals (DACA) program to work for Congress. Current law allows only U.S. citizens or those in the process of becoming naturalized to work for the House and Senate. "If people hear the stories of these 'Dreamers' in Washington, D.C., we would do the Dreamers Act and we would pass comprehensive immigration reform," Kirkpatrick told AZPM in a December interview. The Tucson Democrat said if the bill passes she already knows who she will hire. Arizona Democratic Congressmen Ruben Gallego, Greg Stanton, Tom O'Halleran and Raúl Grijalva are among the 16 co-sponsors of the bill.